In a small heatproof bowl, cover the mushrooms with boiling water and let stand until softened, about 20 minutes. Drain. Meanwhile, in a food processor, pulse the uncut piece of ginger with the chopped scallions and garlic. Add the shrimp and pulse to chop. Scrape the mixture into a bowl; fold in the pork, 1 tablespoon of the black vinegar and 1 teaspoon of salt. Roll into twenty 1-inch balls; transfer to a baking sheet. In a large pot, bring the stock and half of the ginger matchsticks to a simmer over moderately high heat. Using a circular motion, pour the beaten egg into the broth. Wait 5 seconds, then stir the broth to distribute the egg throughout. Add the meatballs, drained mushrooms, tofu and bamboo shoots and simmer over moderate heat until the meatballs are just cooked through, about 5 minutes. Remove the pot from the heat. Stir in 3 tablespoons of the vinegar, the sesame oil and a pinch of pepper. Season with salt. In a small bowl, stir the remaining ginger matchsticks into the remaining 2 tablespoons of black vinegar. 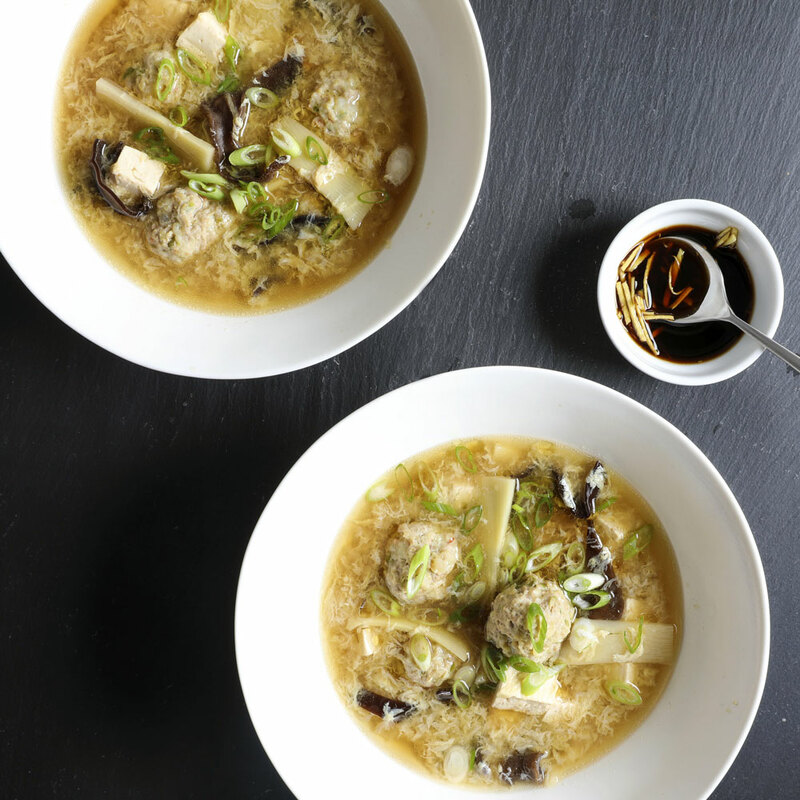 Ladle the soup into bowls, garnish with sliced scallions and serve hot with the ginger-vinegar mixture.